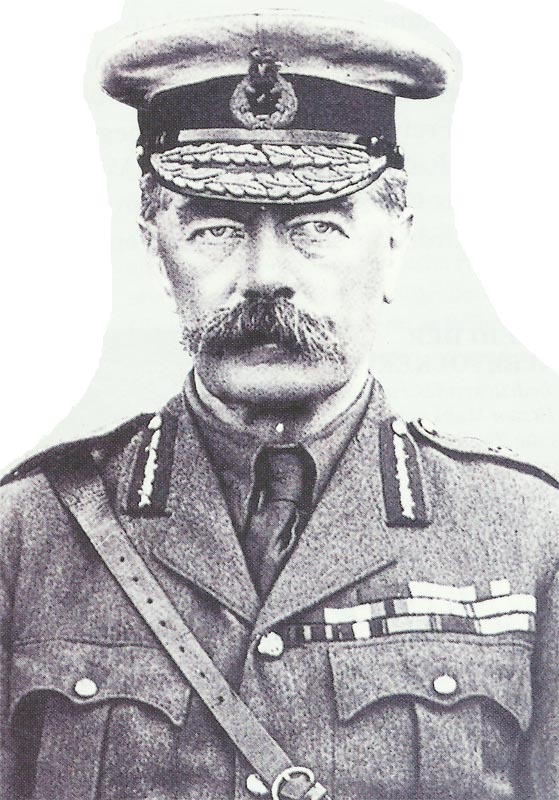 The highly respected war minister, Lord Kitchener. Champagne: French storm crest north of Mesnil and repulse counter-attacks all along Fourth Army front, 48th Division gains Yellow Wood and in Sabot Wood until next day. Russian Northwest Front steadfast ordered. Britain: Kitchener memo to Cabinet urges annexation of Alexan­dretta, Aleppo and Mesopotamia. Rumania: Government refuses the Russian request for eventual passage of troops, calls up 1909-15 conscription classes on March 18. Belgium: Industrial base set up at Le Havre. Britain: Government arms factory powers extended to all potential munition plants; War Departments can requisition on March 23.